The classic hi-tech material, Carbon Fiber has been used in everything from modern fighter jets, to Formula 1 race cars and Storm Trooper Suits (pretty sure it makes a better armor than that blaster magnetic called plastoid) Carbon Fiber was originally created in the late 1800’s by Thomas Edison for use in his newfangled incandescent light bulbs. 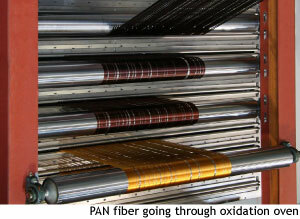 Edison baked cotton and bamboo fibers at high heat in an oven with a controlled atmosphere devoid of oxygen using a process called pyrolysis. These days carbon fiber is manufactured using a smiliar process, but instead of using cotton or bamboo as the starting material (also called the precursor) a blend of Rayon and polyacrylonitrile is used. By heating the precursor in an atmosphere devoid of oxygen, it does not burn. Instead the precursor starts a jammin’ Caribbean beat until all of its molecules form one crazy conga and begin to dance and shake. They party all night long until every atom has passed out and fell off the conga line, except for those Carbon atoms. They’re party animals. Carbon keeps the party rocking until somewhere around 5,500 degrees Fahrenheit. When it cools, you get a crazy strong fiber made from what is now basically pure carbon fiber. Who knew conga lines could science? In most cases those carbon fibers are then woven in to a fabric and and hand laid in to a mold using a process very similar to laying fiber glass, only there’s a vacuum and a rather large oven at the end that is used to cure the resin impregnated fabric. 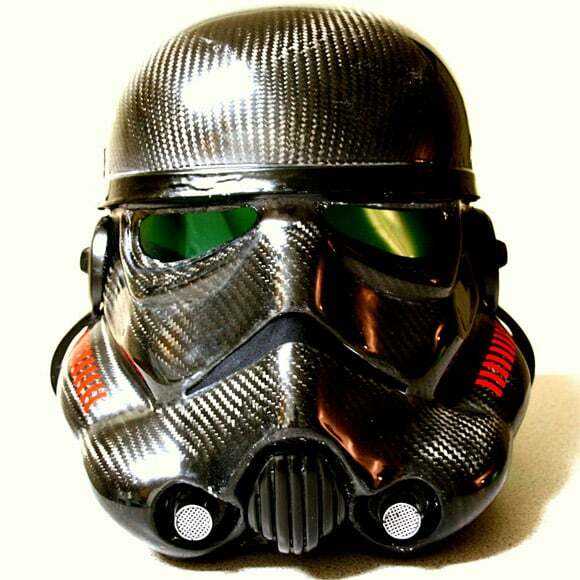 The end result is a super hard shell like our friendly looking Storm Trooper helmet pictured above. The downside to all this awesome is that it’s insanely expensive. As to exactly why that is, check out this article on gizmodo. In our case, a carbon fabric would not work as we are looking for a solid dice, not just a shell. That means we had to find a carbon fiber manufacturing process that produces a solid part. That process is called Filament Winding. In most cases carbon fiber threads are wound around a mandrel and then cured in an oven to make a lightweight, but hollow tube. Much like the process shown in this video. But as I’m sure you are well aware of, hollow tubes can’t be machined into dice. Fear not my friends, for through some magical wizardry I don’t even pretend to comprehend, a very small number of manufactures, (in fact as far as I can tell, that number is one) have done away with the mandrel all together and are able to produce very thick solid filament wound carbon fiber rods in excess of one inch. We use these solid rods to machine our dice, you can see that process in the video below. What you can’t tell from the video is that 3 dice later I was changing the end mill out. Turns out carbon fiber is stupid amounts of abrasive and it loves to eat tungsten carbide like a fat kid loves cake. Once machined the dice are hand sanded to 1200 grit on each face then polished on our buffing wheels to a silky smooth finish. The carbon fiber is left bare and then laser engraved. As far as we are aware these are the first solid Carbon Fiber dice offered anywhere. Our first runs came in clear acrylic boxes but now all of our dice use our standard dice box. A much nicer upgrade from our older style laser cut acrylic boxes. Loved the Storm Trooper Suits (Armor) project. Liking the very idea of solid Carbon Fiber dice. The dice are a little pricey, but that’s life. Hey, Charlie, thanks for another exciting product. thanks Yllidor. the storm trooper suits are freaking awesome. it’s too bad they won’t make them for sale :(. What does a d20 weight? How is the feel of the roll compared to a standard acrylic of the same size? Seriously tempted to add one to my collection cuz of the cool factor, but wondering how much I’d want to actually play with it. they feel a bit lighter than your standard dice, but not excessively so as these are solid carbon fiber, not hollow shells. carbon fiber is much lighter than the materials it replaces, but alot of that lightness is due to the fact you can use much less of it and retain the structural strength. I wanted to see if I can get a larger picture? On a scale of 1 (talc) to 10 (diamond), what is hardness rating of these dice? Just out off curiosity. 6.5, the 1-10 scale is called the MOH scale. So, are these tougher and likely to last forever? Like, so you could take them everywhere and use them all the time. Or, are these more of a show piece that you would buy to show off how cool you are, but they might unravel or something if you used them too much? My understanding of carbon fiber is that it’s typically stronger than equivalent materials, but I’m not sure if that would be the same when used for this purpose. I have bought a set, and I intend to roll them like I stole them. The carbon fiber is held together with resin, I would rate the possibility that it may “unravel or something” as nigh on impossible without deliberate intervention and some sort of solvent. I wouldn’t recommend washing them in acetone. As for strength, I don’t disagree with your statement. But I am sure these dice will hold up to even spirited game play. Can I order a d20 of these but have it be spin down for life counter use? Hey I was wondering if you guys did turn down 20 sided dice? Like for Magic The Gathering life counter. I really want a set, for durability and light weight. However the prices are extra orbital high. Since carbon is one of the most common elements in the universe after hydrogen, why is it so expensive? This was covered up above. Carbon fiber anything is expensive, filament wound carbon fiber manufactured into a cylinder, then milled into dice and laser engraved probably isn’t going to be cheap. If you want the light weight and durability, maybe the titanium or aluminum options might be in your price range. Took longer than expected to get my order for these squared away, but I can definitely recommend them to anyone if they go back into production. They look fantastic! Polished up they are a darker black than in the attached pics, but after putting them to use, I think they actually look better than advertised. Make sure you verify availability of the acrylic cases if that’s a selling point for you – seems like the guys are not making them anymore.